Display technology has come a long way since the introduction of black and white cathode ray tube televisions in the mid-1930s. First there was color, then plasma and LCD and now Organic Light-Emitting Diode technology brings the promise of thin, low power, lightweight, bright, clear viewing. Some organic materials emit light when an electric charge is applied to them. 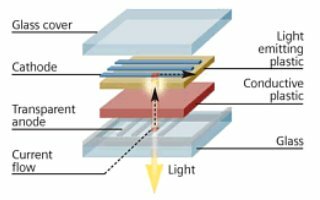 Place such materials on a substrate between narrow cathode and anode strips arranged at 90 degrees to each other and where they intersect forms a pixel and you have a passive matrix OLED. Although OLED is often considered new technology it may surprise you to learn that Kodak created the first small-molecule OLED display way back in the 1980s. Developments since have included making OLED displays using long chain plastics, and incorporating the circuitry in a thin film transistor array to form an active matrix OLED, where the transistor array itself determines which pixels form an image. Requiring no backlight, benefiting from high refresh rates and not suffering motion lag gives such technology obvious advantages over LCD displays but OLED also consumes much less power, making it ideal for devices that rely on batteries for power. An extremely thin self-luminous AMOLED display not only brings rich contrasts and vivid colors but also a wide viewing angle. It doesn’t suffer from the size limitations of passive technology, can be quite tough (as demonstrated here) and if manufactured on plastic substrates, can be made flexible and even waterproof. Great strides have even been made to bring the often quoted limited lifespan in line with other display technologies. The bright display technology has already found its way into a whole host of devices in daily use – from electrical appliances and entertainment systems to cameras and printer interfaces to phones and of course TVs (although commercial flavors are currently quite small and very expensive). At one time OLED was thought to be heading for Apple’s iPad too but that turned out to be just one of the many iPad-related rumors. But what makes AMOLED so exciting is the possibility of what might be, what is yet to come. 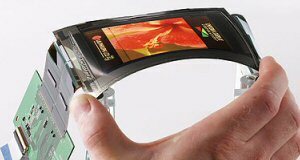 Being such a slim, lightweight and flexible display medium could well see it being used to read the daily news or the latest blockbuster novel. The iPad (and other tablet PCs, notebooks and PDAs) can of course be used for such things but what makes e-readers such an attractive proposition is the lack of backlit LCD. Imagine if such reading material was available on a roll-up, bright, color, low power portable device! Now turn imagination to overload and see AMOLED displays on vehicle dashboards, turning gaming devices into full-screen, dazzling color touchscreen displays, spread across billboards of the highways and byways throughout the land or even on such things as custom display jewelry, restaurant tables, and so on. 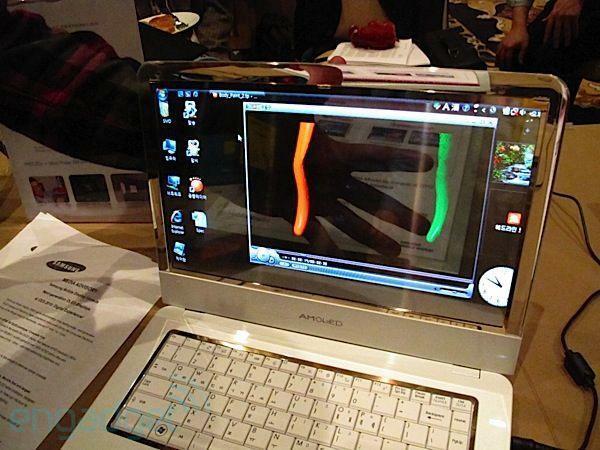 Samsung proudly displayed a transparent AMOLED laptop screen at this year’s CES so the possibilities really do seem to be limited only by how far the imagination can be stretched. With AMOLED about to hit the news again when Samsung launches a new phone on its Bada operating system on February 14 at the Mobile World Congress in Spain, what possibilities do you see for the technology in the coming weeks or months?